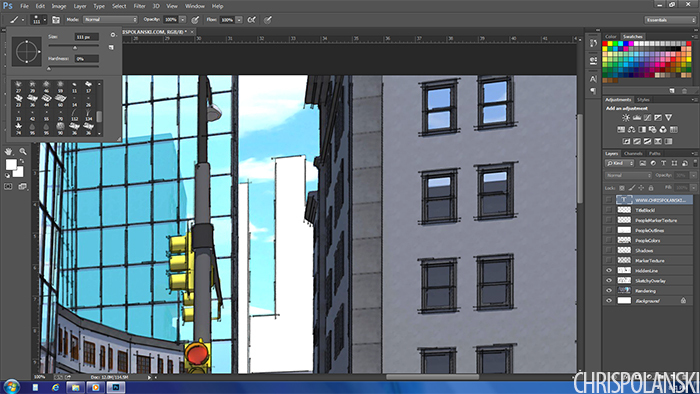 The sketchy mid-rise illustration outlined here doesn’t distance itself too much from a direct SketchUp image export – instead it utilizes a few quick editing techniques to emphasize certain portions of the image while softening others that are not as crucial to the final composition. While certain SketchUp styles can be customized to give you an output similar to the final image shown here, I like to be able to independently adjust each image to get the final illustrative look I want. The final image as shown required the use of three programs for the main graphics– SketchUp, Kerkythea and FotoSketcher – all of which are completely free to download. Finally everything was brought into Photoshop for post processing. I should note that a very similar result can be achieved without the use of any rendering engine by instead substituting the Kerkythea rendering with an image exported directly from SketchUp with color and textures on and edges off. The reason I used Kerkythea here was to get the slight reflections on the glass faces and softer shadows. Three main images were used as the base, pictured below. 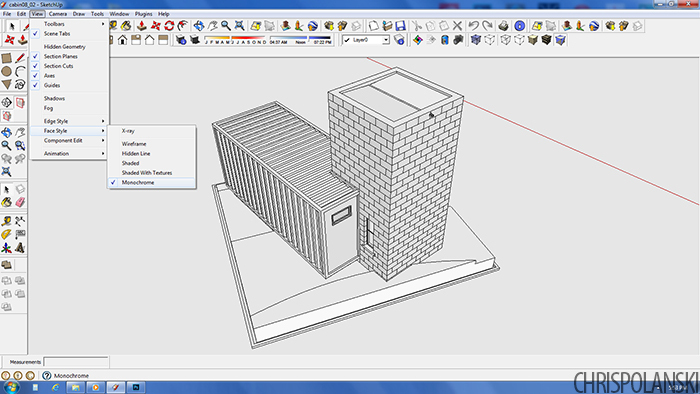 First is a SketchUp export using the “sketchy pen black” style while the second is a “hidden line” export. Third is a Kerkythea rendering for color, texture and shading. I’ll note here that the “hidden line” image should be desaturated and then level adjusted so that it is black and white. Two of the images were then processed in FotoSketcher, both using the “painting5 (watercolor)” style. I chose to do this instead of using the watercolor filter in Photoshop because I feel that FotoSketcher both allows greater control over the filter settings and produces a better result. The Kerkythea rendering was processed first to lighten, texture and somewhat blur the image. The “sketchy pen black” SketchUp export was then processed using the same settings to give the linework a slightly more “painted” feel. The results appear below. From there the two FotoSketcher images and the “hidden line” SketchUp export were brought into Photoshop. The Kerkythea rendering served as the base with the “hidden line” image in the middle and the “sketchy pen black” export on top. I set the layer mode of the sketchy image to “multiply” and turned down the opacity to 60%. From there I selected the middle “hidden line” layer, chose a soft brush with an opacity of about 20% and simply began erasing where I wanted color to show through. This step basically erases portions the “hidden line” image and reveals the rendering below. As more passes are made with the eraser portions of the image will appear darker. The picture below shows the image after several passes were made with the eraser and a sky was added. I also chose to lighten the linework at the edges of the image by using the eraser with lowered opacity on the top “sketchy” layer. Finally the vertical lines were made parallel by going to Edit > Transform > Perspective and dragging the top of the image while all three layers were selected. I wanted to give the illustration a little additional hand drawn feel. Going back into SketchUp I created two new layers specifically for guidelines – one for the featured building in the center and another for the context buildings. I exported each separately, overlayed them in Photoshop, set the layer modes to multiply and erased the portions I did not want in the drawing with a soft brush. Finally the opacity of each layer was turned down so that the guides were visible yet subtle. 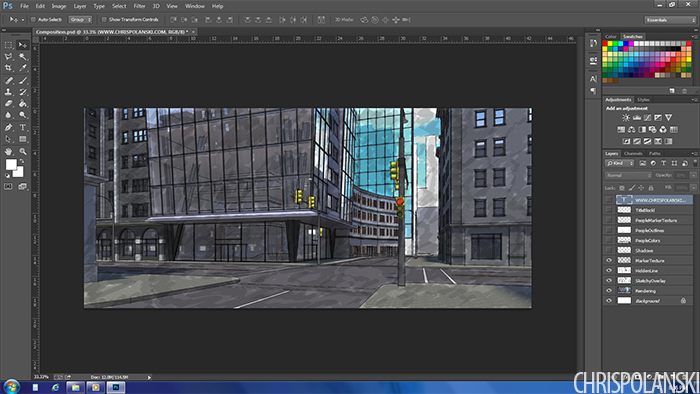 Finally, vehicles and figures needed to be placed in the image to add some life to the scene. 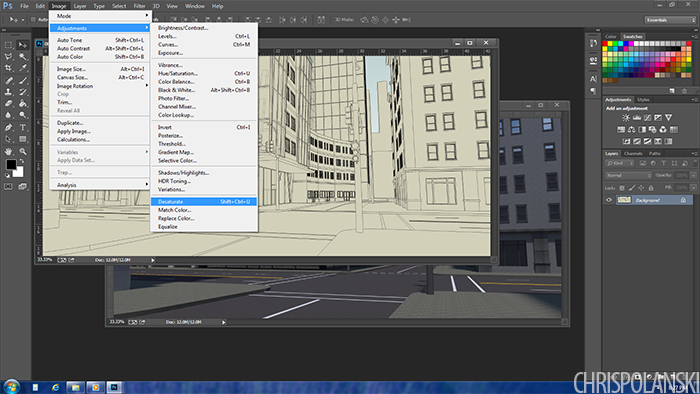 Instead of manually placing cars into the image in Photoshop I created a new layer in the SketchUp model and placed them around the scene. 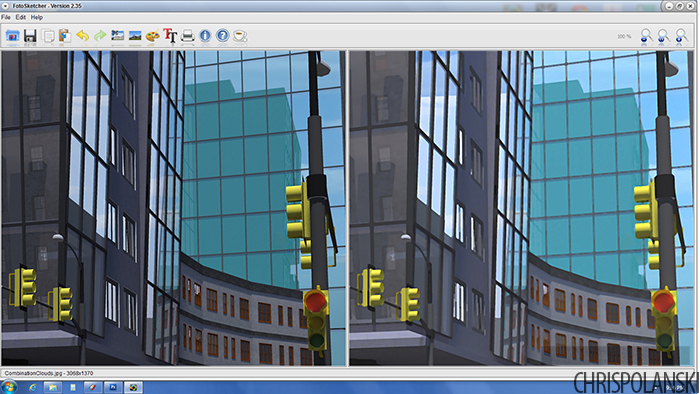 In SketchUp I turned off all of the other layers and exported only the cars as seen below. If possible I like to add vehicles this way because it maintains both the correct size and perspective of every car. Also, by keeping the vehicles on their own layer I was able to adjust the levels, colors and opacity so that everything blended together better. Lastly, figures were added manually (along with shadows) to complete the image.